Navy personnel with some of the beedi leaves seized. 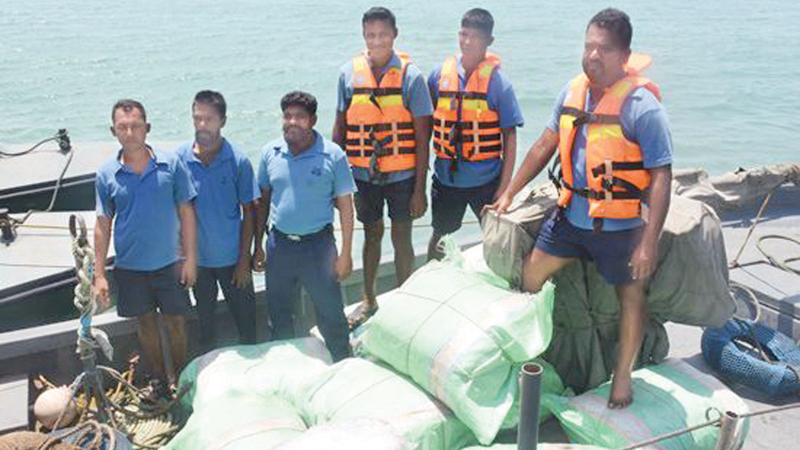 Naval personnel attached to the North Central Naval Command, apprehended four persons with 2,026.84 kg of beedi leaves, during a raid carried out in Thlaimannar on Friday (29). Meanwhile, a further 1,053.75 kg of beedi leaves were recovered in a search conducted in the same area, on Saturday (30). Altogether 3,084.26 kg of beedi leaves have been recovered in the Naval raids carried out on Friday and Saturday. The beedi leaves were packed in parcels and it is believed they originated in India. The stock of beedi leaves was handed over to Customs in Jaffna. Sri Lanka Navy carries out frequent patrols along the territorial waters and coastal line to foil attempts of smuggling across the sea.